Baby slings have grown in popularity over the years and many parents are using them to carry their young children around in an easier and more efficient way. These top rated baby slings top the list as customer favorites. We’ll share their features and benefits that make them so popular and help you decide which one is the perfect baby sling for your needs. With all of the different kind of baby slings on the market to choose from, deciding which one to purchase can be quite a challenge, especially if this is your first baby or you are new to using slings. There are several things that go into choosing the right baby sling. Factors such as style, price, function, features and even the brand name all can play a part in determining whether a particular baby sling is worth purchasing. The three top rated baby slings we have featured here are all manufactured from well known names in the baby product industry. They are known for their ease of use and performance and the prices are great too. To avoid the hassle of purchasing a baby sling that doesn’t work for you, take a look at the detailed reviews below. It can help you narrow down the choices so you don’t make a mistake in choosing. 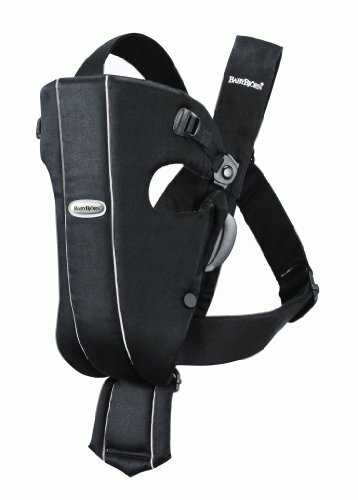 BabyBjorn is a well known and respected name in baby carriers and slings and this one is no exception. This small and compact sling style carrier is specifically designed to fit your baby right from the first day of their life. It is a front position carrier and it’s very easy to put on and take off. There are minimal adjustments that need to be made while you are putting it on and once you get used to it, you can make these adjustments by yourself even if no one is around to help you. The latches are well designed and strong, clicking shut securely so your baby is safe. These latches can be operated with one hand. Due to the 2 piece design, you can easily put your baby into the carrier without assistance and if they fall asleep while you are carrying them, taking them out without waking them is easy too. The BabyBjorn comes in three different fabric types and multiple color choices to appeal to all kinds of moms, it is pediatrician recommended and the materials used are all safe and tested material. The Babybjorn baby sling carrier can be used from newborn up to 25 pounds. It has a gentle back support as well for the baby. It is the perfect way to keep your baby right there close to you while you run errands, (do not wear the baby in the sling while you are driving. Babies should always be in an approved and certified car seat properly strapped into the vehicle.) The comfortable cotton material washes easily and feels good close to your baby’s skin. You can even carry your baby facing forward once they are a little older and can hold their heads up securely on their own. The Babybjorn makes a perfect baby shower gift for new moms and dads to be. This GOTS certified soft cotton, baby sling carrier is a great combination of sling, wrap and carrier all rolled into one. There is no other carrier on the market that allows parents to carry their children from birth to three years old in many different positions. Unlike some slings, the Baby K’tan is perfect for premature babies and babies with special needs. It is lightweight and compact; fitting over both shoulders so the baby’s weight is evenly distributed. The adjustable back support band offers mom and dad extra back support and makes it easy to carry their baby around without feeling soreness and pain. This 100% organic cotton baby sling has no snaps, buckles, rings or hardware of any kind to worry about. 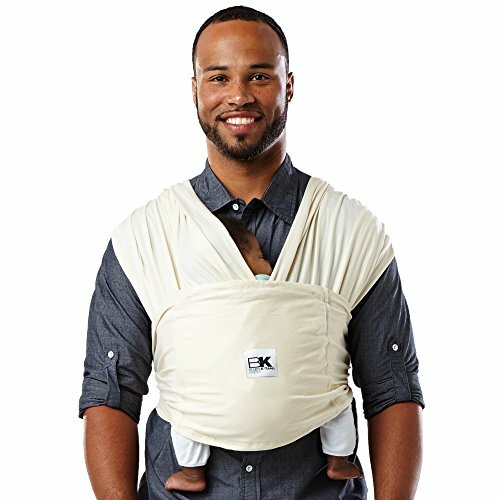 It is super simple to use and has a unique double loop design to provide added security for carrying your baby. It is also great for nursing moms and the baby can be nursed while still in the sling. It’s very easy to put on and take off and has a free carry bag that it comes in for when you are not using it. This GOTS certification means that the organic cotton used to make the Baby K’tan is free of harmful chemicals, formaldehydes and azo dyes. It is machine washable. There will a slight amount of shrinkage that will happen when the sling is washed, but just like clothing, after you wear it for a bit, it will loosen a bit. If you are concerned about it shrinking too much, hang dry the sling after washing rather than drying it in the dryer. There are 6 different positions that you can carry your baby with this Baby K’tan. Some positions will not be suitable for newborns so be sure to read all the enclosed instructions. It is available in several color choices and makes a terrific gift for an expectant mom. With the Boba Bay Wrap you will have a sling that makes it easy to carry your baby around in comfort and style too. This sling is perfect for babies from birth all the way up to 18 months old. There are no buckles, straps or snaps to get in the way or worry about and you will get a perfect fit every time you put it on. Wrap instructions are included so parents can get the hang of how to use it. It is made from a combination of 95% comfortable, soothing cotton and 5% spandex for a little bit of give. The weight limit for comfortable carrying tops out at 35 pounds which will include toddlers. You can carry your child with the front and infant hold styles and it’s perfect for breastfeeding moms. Cleanup is easy since it is machine washable. If it gets dirty or messed up just toss it into the wash and dry it on a low heat setting and it’s all ready to go again. This is the perfect sling style carrier to free up your hands if you need to do something, yet you want to keep your baby close to you. With all the benefits of that using a sling provides, this is one that will make it easy to use on a regular basis. Using s baby sling, or “baby wearing” as it is commonly called is a great way to build a strong bond between the parent and baby and also goes a long way towards keeping the baby from becoming fussy or irritable. Babies love the snuggled feeling they will have when inside the sling and most parents notice that there is much less crying when they make a habit of carrying the baby in the sling. Another popular benefit to the sling is that it frees up the hands so you can perform other tasks as needed. The top rated baby slings reviewed here are all perfect for baby wearing and provide the parent with an easy to use and comfortable way to safely keep their babies close to them while they do other things. Once you get used to using the, you will find it very enjoyable to have your baby close all the time. There are many benefits to carrying your baby in a baby sling. This is also known as baby wearing and the custom has grown in popularity over the years. Carrying your baby in a baby sling makes life easier in general for mom, dad and the baby too. It is a very popular practice in many cultures and has gained noticed and popularity in Western cultures too as the benefits are discovered. We’ve listed several of the most notable benefits to carrying your baby in a sling. Close physical contact is very important for a newborn, both physically and psychologically. Using a swing to get this closeness, allows for the contact that is good for the baby, and still allows the wearer to have their hands free for needed tasks, including taking care of older siblings. Colicky babies are much less uncomfortable and fussy when being carried in a sling. The upright position that is used for slings puts a slight pressure on the tummy of the baby and that alleviates a lot of reflux and gas problems. The sling also provides a gentle rocking motion as the wearer moves around that colicky babies find very soothing. Carrying the baby in a sling is much easier and more convenient than using a stroller. Strollers are bulky and cumbersome. They are difficult to maneuver up and down store aisles and over all they can just be a pain sometimes. Having the baby in the sling keeps your hands free, takes up no extra space, protects the baby since they are right there next to your chest and you don’t have to worry about where to put the stroller. Using a baby sling gives the baby a chance to view his/her world from a protected perspective. From right there against mom or dad’s chest, they can look around at their surroundings and be included in the action easily and in a very secure manner. Wearing the baby in a sling is a great way to keep a sick baby close to you so you can keep an eye on them. It soothes them and allows the wearer to monitor fevers so the baby is safe and sound. Babies that are regular carried in a sling are more settled and tend to sleep for longer periods of time than those that are left in infant seats, swings or cribs. It has been shown that digestion is better in babies that are carried in slings as well. Because they are held in a more upright position, which is much more comfortable and better for digestion. They also cry much less than babies who are not carried in slings. Babies are not the only ones that benefit from carrying the baby in a baby sling. Keeping the baby close has been shown to help reduce the incidents of post natal depression and promotes bonding with the baby as well. It also stimulates milk production and is perfect for easy nursing. Premature babies gain weight faster when they are carried close to the chest in a baby sling and have more stable temperature regulation as well. There are a few points to consider when you start researching the different baby slings on the market. The type of sling that you need will depend of how often you will be using the sling, the size and age of your baby, and what you will be using the sling for. What is the age of your baby? – Some slings are better suited for specific age groups. A stretchy type of sling is much better suited for a newborn, but doesn’t work as well for older, heavier children. On the other hand, a sling that has more of a framework to it does not lend itself well to carrying a small baby but is terrific for a toddler. Your best bet is to find a sling that has the capability of working for newborns and has the ability to be adjusted to accommodate older children too. Who is going to use the sling? – If the sling will be used by one person only, it is okay to purchase a sling that doesn’t have a lot of adjustability. You can find one that fits the size you are and be fine. If more than one person will be using the sling, make sure to get a style that is fully adjustable according to the size of the person wearing it. How often will the sling be used? – If you will be using the sling regularly and for longer periods of time, you want to be sure that comfort is a big consideration. Even distribution of the weight is important for the comfort of the parent carrying the child. The best sling will distribute the weight evenly across the shoulders and back. Easy to Use – Slings can be a bit of a challenge to learn how to put on and adjust so find one that has clear, easy to follow instructions and that doesn’t have a lot of buckles, snaps and rings to adjust and fuss with. The easier the better since most of the time, you will be getting in and out of the sling by yourself. There are several different kinds of slings available to choose from. Knowing the differences of these choices will help you narrow down the selection you have to sort through to find the ones that will work with your particular goals and needs. Padded slings – Some styles of slings have a shoulder pad that doubles as a head support for the very young baby. It comes with padding that is on the edge of the fabric and usually has a plastic ring that holds the padding in place. The fabric can be passed through the ring to change seating positions and fit and make sure it is the right fit for the baby. Wrap Slings – This type of baby sling is made of unpadded cotton and typically has more fabric than other types of slings. The extra fabric is used for adjusting the sling to fit a variety of people sizes and works very well for parents that are very different in height and size. Most baby wrap slings can be adjusted to carry the older toddler on the back and they can typically hold up to 35 pounds or so. Pouch Slings – These simple pockets of fabric are typically worn over one shoulder. They can be put on and taken off very quickly and easily and work terrific for young babies or can be adjusted to a toddler for keeping them on the hip. Soft, Structured Slings – These slings have a bit more “form” to them and fasten with buckles. They are usually easy and fast to put on and then you adjust them. They are worn in front, on the back or on the hip. Stretchy Slings – The stretchy fabric that makes up these slings is in one long piece of material that can be pre-tied while the baby is out of it and then adjusted once they are in it. This type of sling can only be used as a front style sling. 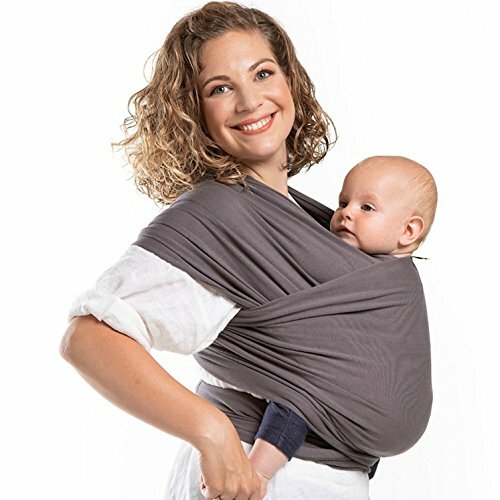 Stretchy Combo Slings – With the hybrid sling, you get both, the flexibility of a wrap that slips on over the head and adjusts by pulling the material through the rings that are located on either side of the sling. They can accommodate the child from birth to toddler in many different carrying positions. Baby slings have many different features that you can look for when you start shopping. These features make the baby sling even more convenient. Versatility – You want to look for a sling that allows for adjustments to differences in the wearer’s height and body size as well as those that will adjust to the size of the growing baby as he or she gets older and becomes a toddler. Some of the front carriers may have an insert that is used when they are tiny, that will be removed as they get bigger and gain more body/neck control. Comfort for the Wearer – Padded shoulder straps that are wider are much more comfortable than barrow straps that can dig into the wearer’s shoulders. They also help to distribute the weight evenly over both shoulders which prevent shoulder, neck and back strain. Look for sizes that will accommodate all the wearers in the house or find a sling that is fully adjustable to fit many heights/sizes of wearer. Comfort for the Baby – You want your baby to be comfortable in their sling so look for designs that provide enough support and allow for plenty of room for them to be comfortable and not constricted but yet snug enough that they feel “hugged”. Breathable fabric is also important so the baby doesn’t overheat. Sturdy design – Make sure that the design of the sling is sturdy and durable. You want to ensure that the baby will be supported securely and that any and all straps, buckles, snaps or rings are in good, working order. Easy to Use and Adjust – If you have to have help with the adjustments or need help putting the sling on, you will become frustrated quickly and will more than likely not use the sling as much as you would if it was easy to put on and take off unassisted. Look for easy to use slings that offer one handed operation and few steps. Accommodates Nursing Mothers – If you will be breastfeeding your baby, make sure the sling you get accommodates you being able to nurse them while they are in the carrier. It can make things a lot easier and more comfortable if the carrier can be where they can burse comfortably as well. Appropriate for the Weather – Dark colors heat up quickly so wearing them in the heat of the summer may become unbearable for both of you. Look for a sling that works for your climate or consider purchasing a winter fabric sling AND a summer fabric sling to accommodate the changes in the temperatures for each season. Easy to Clean – Machine washable is the phrase of the day when it comes to cleaning the baby sling. Babies can be messy so having a means of cleaning the carrier easily will make it much more enjoyable to have and use. To avoid shrinkage, machine wash and then line dry it. Safety is always a consideration when it comes to your baby. Here are some good safety tips to remember when it comes to using a baby sling. There is an acronym that helps parents remember the safety rules. It’s called the TICKS safety guidelines. T: Tight – The baby needs to be close to the body so they can’t slump down into the sling which is uncomfortable and not good for their development either. I: In view at all times – You always want to be able to look down and see your baby’s face. If they are so deep in the sling that their face can’t be seen, the sling needs to be adjusted, as this is not safe. C: Close enough to kiss the baby’s head. – The baby should be positioned in the sling high enough that you can kiss their forehead if face. This is for the safety of the baby because with them being this close, you can see if there are any problems such as spitting up or choking. K: Keep the baby’s chin off of their chest – Make sure there is at least one finger’s space between the baby’s chin and their chest. This allows them to breathe easily and doesn’t compress their chest or throat. S: Support the baby’s back – You want to be certain that the baby’s back is supported when they are in the sling. That supported position should be a natural one for the baby. The ideal position is with the baby’s tummy towards the wearer in an upright position. Their bottom should be in the deepest part of the sling, not their feet. Their legs should be a little higher than their bottom in a natural position as well. If you are looking for alternatives to the traditional bulky and sometimes cumbersome gear of strollers and car seats, you will love a baby sling. With all of the choices available, sorting through all of them to find the one that is perfect for your needs can be a challenge. Some parents resort to guessing and just choosing by chance, but we offer you reviews and this buyer’s guide so that you may learn about slings and make an informed decision. When you have the right information, all of those choices aren’t overwhelming anymore because you know what you are looking for in the way of features, styles and types. Now, when you search through the different baby slings available, you will be confident in the choice you make and will enjoy using it to keep your baby close for a long time to come.